Onward we go, reveling in the gorgeous ethnic splendor of the pictures and stories shared by you this Dasara. Aalayam feels truly honored to be a vehicle to bring your fond Dasara imagery to the world! The village in my Golu, which I would like to call Thillaistanam, after my own in my hometown of Thanjavur, depicts a typical morning in a village. The paddy fields are being ploughed by oxen and saplings are being planted, a cartful of grain is ready to be transported on a bullock cart, the vegetable seller is going about her business of selling organic vegetables, typically grown on the small patch of land she owns. A family is celebrating Pongal and the Pongal is being made and offered to Surya Bhagavan in front of their home as a thanking gesture for a great harvest that they have been blessed with. 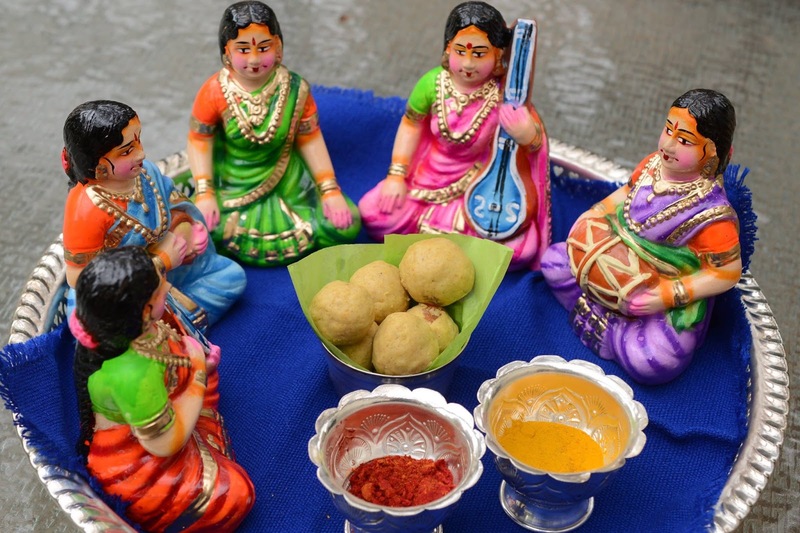 The 2 big dolls are a signature of Tanjavur, the ' Tanjavur Thalai Aati ' bommais that are famous all around the world. I, too, am in the US and festivals such as these are my links to the good old days. My dolls/bombes are very close to my heart as I remember who has gifted me each one. The dashavatara, for instance, was gifted to me by my chikkamma ( younger maternal aunt), The pattadha-bombes by my mom during my wedding, Vasudeva carrying Krishna, by a very close friend of my mom and so on. When I arrange these dolls, I remember them, the day I received them. Everything. Somehow that makes me feel that they are all a part of my festival here. Each and every doll/statue of this display is special to me, as each one is collected by my over the years. Living in the country away from where you were born and raised makes it challenging to instill your cultures and traditions within your children. But I feel I have passed and blessed when I see my 8 year old little girl creating her own display besides mine. 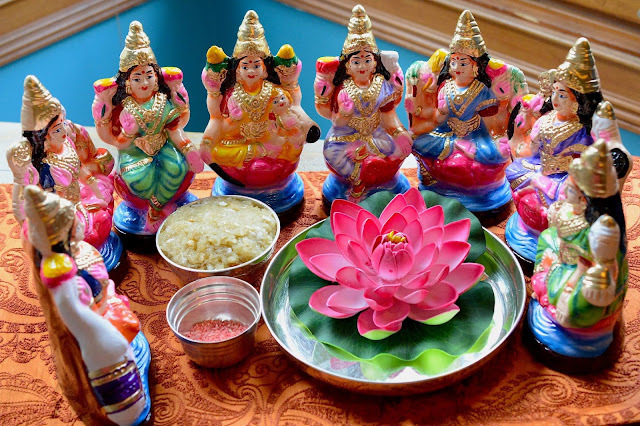 The tradition of Navarathri Golu for me is about celebrating the 'Shakthi' within all of us.I think of it as a time to refocus and channel my inner strength to achieve my dreams by soaking in the positive energy that emanates from the golu. I enjoy collecting Ganeshas and I am constantly on the lookout for unique figurines. 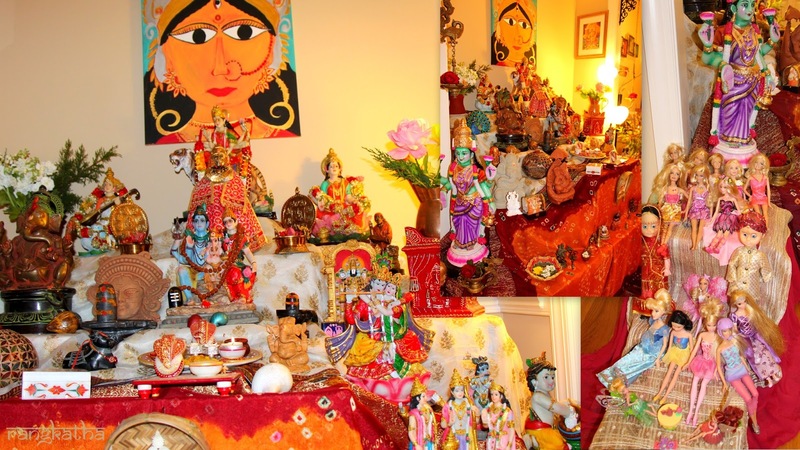 Happy Navarathri! More happiness to you all! 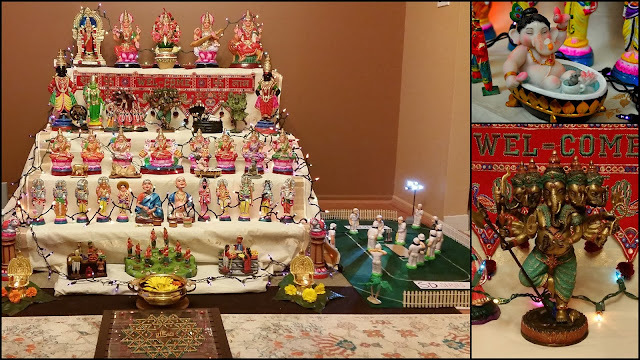 Dusshera (Golu) is such a creative representation of the Indian epics and also a reminder of the colorful and rich culture we grew up with. This is the picture of the Saraswathi Puja done by my parents today for Navarathri, My mom stitched the saree for her doll which is 62 years old! Her Veena is also 52 years old. I want to wish all of you a Happy Saraswathi Habba! Today, I made my kids do the Puja in our home, here's a picture of the Goddess Saraswati, in her resplendent glory! It is heartwarming to be able to partake in your festivities, to hear your sweet stories, and to share your enthusiasm! The Dasara Bombe Party was so popular this year at Aalayam, Deepa and I are planning to make this an annual tradition! Before we go, we want to share with you some more Golu pictures, some that our readers and friends, like Sangeetha and Suchitra shared, and some from Deepa and my Bombe Habba tableaux! We feel a pang of melancholy that the Habba is drawing to a close this year, but we will sharpen those storyboarding pencils, as we create our "kathas" for next year to set the Bombes on the stage we create, in our homes, with our families! But for now, enjoy Deepa's rendition of the musical ensemble of Kalaimani Columbus Sisters! Replete with Bombe baagina (divine offering) with her mom's scrumptious besan ladoo. And presenting too the Ashta Lakshmi congregation from Deepa's abode! Finally, the labor of love from my household, this Dasara! The Ten-headed Ravana (the ten headed demon king who kidnapped the heroine of Ramayana) take center stage in the Ramayana themed ensemble wall display!! What fun it was to design the Ravana masks, shop for supplies and put our creative heads (ha ha, pun intended!) together (all girls in the house, including my twin 6 year olds!) to bring the Ravanas to life! That’s what festivals do, they act as fertile ground for creating memories, for fostering the sense of community and for strengthening relationships (yes, even the tumultuous ones!) . HI, my name is Preeta. I reside in Muscat, Oman. I am a follower of your blog. I love your posts about decor and home tours. But today, I was really touched and overwhelmed to see all the colorful and traditional display of bombe Habba. Kudos to both of u for bringing it before us. Proud of our culture and festivals. Thank you Preeta! We are truly humbled by the overwhelming response we got for the Dasara Bombe Party and we feel very proud of our culture and festivals too! Happy VijayaDashami to you too! Hats off to all your efforts! I always love to read your blog. It makes me feel very close to my culture and traditions while reading all your interesting posts. Also, I feel a great sense of admiration to all the participants who are keeping the traditions alive and passing it to the next generation!! Thank you Gowri. It's the support and the warmth of people like you that keep us going! Everybody knows that Hinduism is an age old religion, it's roots are in every Hindu's heart. It's culture and traditions vibrates due to constant efforts of many individuals and groups of people who keep it alive. In this context, I congratulate Ms. Supriya for her noble effort to bring together many Indian Hindu families who are spread throughout the U.S through her blog. Thank you Uncle!! It's words of encouragement such as this that keep us going!! Thank you for your patronage and your blessings.